Johann J. "John" Sawatzky: minister; born in Rosenthal, Chortiza Mennonite Settlement, South Russia on 5 August 1900, the sixth of 10 children of The parents of John were Johann Abraham Sawatzky (3 December 1863, Rosenthal, Chortitza, South Russia – 7 September 1941) and Justina (Redekop) Sawatzky (16 March 1868, Rosenthal, Chortitza, South Russia – 2 May 1934). 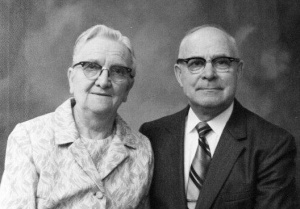 On 27 March 1927 John married Maria Neufeld (13 March 1904, Didsbury, Alberta, Canada – 13 October 1987, Abbotsford, British Columbia, Canada) in Disbury, Alberta. Maria was the daughter of Abram C. Neufeld (1871-1934) and Elisabeth (Heinrichs) Neufeld (1872-1953). John and Maria had six children, including two sets of twins: Andrew, Mary and Abram, Helena, and Hans and Henry (died at birth). John Sawatzky died of cancer on 11 November 1986 in Abbotsford, British Columbia (BC), Canada, at the age of 86. Both John and Maria are buried in the Maclure Road Mennonite Cemetery in Abbotsford, BC. John attended high school (Zentralschule) in Rosenthal, and upon completion of his studies, became a school teacher in a neighboring Jewish village. With the calamitous consequences of the Russian Revolution in 1917 and the civil war which followed, life for the Sawatzky family was severely impacted. John contracted typhoid fever, landing in the Tokmak hospital. When the front of the civil war was about to engulf Tokmak, all the patients, including John, were shipped by train to the historic Black Sea port of Kerch. From here John was able to get onto a barge which was towed across the Black Sea to Constantinople. With the assistance of Mennonite Central Committee European staff, John found passage on the steamship Acropolis, sailing to North America. On 1 September 1921 he landed at Ellis Island, New York. For six agonizing weeks he was held in a detention camp, not knowing if he would be sent back to his port of origin, or allowed to enter the United States. On 15 October 1921 he was given permission to remain in America, and at once sent to a farm in Nebraska where he worked as farm laborer, picking corn. In July 1923 he was baptized in the Salem Mennonite Church in Wisner, Nebraska. By this time John had heard that relatives lived in Carstairs, Alberta. After arranging his affairs in Nebraska, he decided to make Canada his permanent home, settling in Didsbury, Alberta. On 27 March 1927 he married Maria Neufeld. Owing to bizarre Canadian immigration laws of the time, Maria lost her Canadian citizenship when she married John; only to have this right restored when John became a citizen a few years later. In 1931 the Bergthal Mennonite Church in Didsbury called John to the ministry. During this time he worked as a telephone lineman to support his family. In the early 1940s Alberta Mennonites began moving to Calgary in significant numbers. By 1944 a Mennonite congregation began meeting in Calgary with the support of the Alberta Conference of Mennonites. By spring 1945 John Sawatzky became the leader of this congregation. A year later a building was purchased which became the Scarboro Mennonite Church. In 1948 the Sawatzkys established a girl’s home (Mädchenheim) in their home to assist young post-war Mennonite women finding employment in the city. As the minister’s salary was modest, John Sawatzky augmented his income by building houses. However, for the Sawatzkys, attending to congregational concerns remained their priority. When the Conference of Mennonites in Canada convention was hosted in Calgary in 1945, Maria was in charge of the food preparations for the delegates. She also assisted in the ministry of the church as a pianist. For many years John was the secretary for the Conference of Mennonites in Alberta, and also served as vice-chairman and chairman. John served the Scarboro Mennonite Church as leading minister from 1944 to 1958, and again from 1961 to 1962. In 1955 this congregation became financially independent; as a result in 1957 changed its name to First Mennonite Church. In 1964 John Sawatzky received a call from the Clearbrook Mennonite Church. He served this congregation as pastor from 1964 to 1972. In his retirement John wrote an account of his journey from Constantinople to New York. GRANDMA (The Genealogical Registry and Database of Mennonite Ancestry) Database, 6.02 ed. Fresno, CA: California Mennonite Historical Society, 2010: #416695. Harms, Helen. "Sawatzky, John J. (1900-1986)." Global Anabaptist Mennonite Encyclopedia Online. June 2010. Web. 22 Apr 2019. http://gameo.org/index.php?title=Sawatzky,_John_J._(1900-1986)&oldid=155952. Harms, Helen. (June 2010). Sawatzky, John J. (1900-1986). Global Anabaptist Mennonite Encyclopedia Online. Retrieved 22 April 2019, from http://gameo.org/index.php?title=Sawatzky,_John_J._(1900-1986)&oldid=155952. This page was last modified on 5 December 2017, at 09:04.